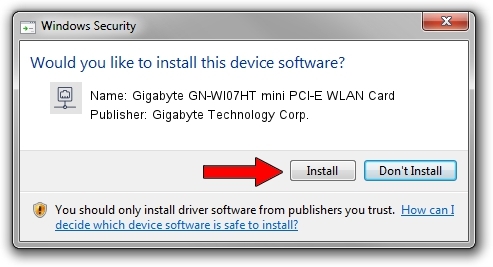 You can download from the link below the driver installer file for the Gigabyte Technology Corp. Gigabyte GN-WI07HT mini PCI-E WLAN Card driver. The archive contains version 10.0.0.276 dated 2013-12-16 of the driver. This driver was rated with an average of 3.4 stars by 87253 users. Take a look at the list of detected driver updates. Search the list until you find the Gigabyte Technology Corp. Gigabyte GN-WI07HT mini PCI-E WLAN Card driver. Click the Update button.